On December 1, RUSH will release a lavish, new and expanded edition of the landmark album “A Farewell To Kings” — the fifth studio album originally released in 1977, which introduced the radio hit “Closer To The Heart”, album tracks “A Farewell To Kings”, “Madrigal”, “Cinderella Man”, as well as enduring fan favorites with “Xanadu” and “Cygnus X-1”. 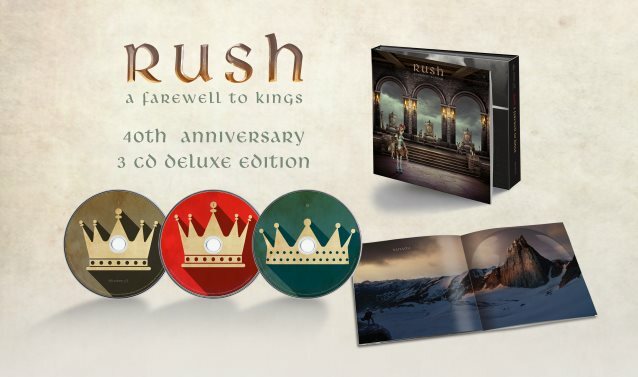 “A Farewell To Kings – 40th Anniversary” will be available to fans in four distinct configurations, including (1) Super Deluxe Edition, (2) three-CD Deluxe Edition, (3) four-LP Deluxe Edition, and (4) the Deluxe Digital Edition. The Super Deluxe Edition includes three CDs, one Blu-ray Audio disc and four high-quality 180-gram vinyl LPs. The set encompasses the Abbey Road mastering studios 2015 remastered edition of the album for the first time on CD; a complete RUSH concert recorded in February 1978 at London’s Hammersmith Odeon, newly mixed by longtime RUSH engineer and original “A Farewell To Kings” producer Terry Brown from the multi-track live tapes; four newly recorded cover versions of songs from the original album by DREAM THEATER, BIG WRECK, THE TREWS and Alain Johannes; and an instrumental studio outtake of the spacey sound effects the band has creatively titled “Cygnus X-2 Eh”. The Hammersmith show features, for the first time ever, over thirty-four minutes of unreleased performances including a complete “2112” suite, “Lakeside Park”, a drum solo and “Closer To The Heart”. The Super Deluxe Edition’s audio content on its CDs is duplicated on its vinyl discs. Meanwhile, the Blu-ray audio disc contains a brand new 5.1 Surround mix of the album by four-time Grammy-nominated Surround Sound producer Steven Wilson, along with three original 1977 promo videos from a newly found two-inch quad video master significantly improving the video quality for “Closer To The Heart”. 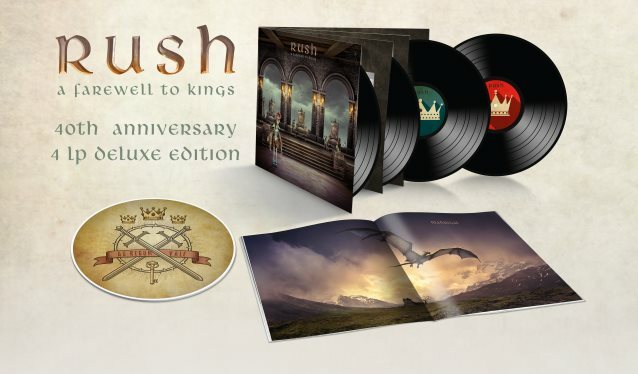 The Super Deluxe package also includes an elaborate new fortieth-anniversary cover treatment by longtime RUSH creative director Hugh Syme, who has also created a new piece of artwork for each of the album’s six songs, and an extensive twelve-thousand-word liner notes by Grammy-winning rock historian Rob Bowman. 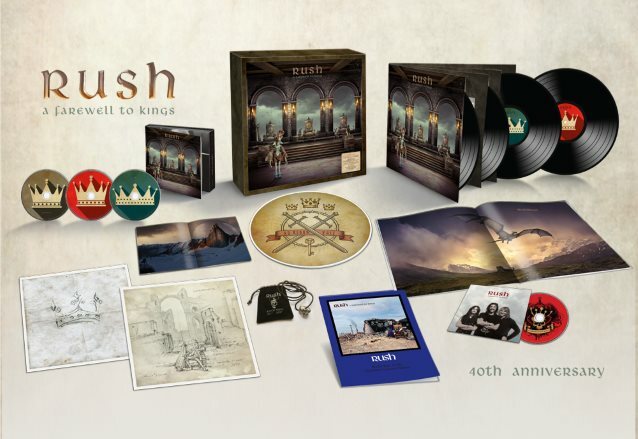 The Super Deluxe Edition of “A Farewell To Kings – 40th Anniversary” will also include several exclusive items, including a unique King’s Ring, with custom velvet pouch and neck chain; two lithographs with original artwork by Hugh Syme; a special twelve-inch turntable mat featuring distinctive artwork by Hugh Syme; and a reproduction of RUSH‘s original 1978 “A Farewell To Kings” tour program. “A Farewell To Kings – 40th Anniversary” second configuration will be released in a three-CD Deluxe Edition, with the newly reasserted “A Farewell To Kings” album, the Hammersmith Odeon show, the four new cover songs, “Cygnus X-2 Eh” outtake, Hugh Syme‘s song-specific artwork and Rob Bowman‘s liner notes. The third configuration will be offered as an audiophile 180-gram four-LP Deluxe Edition featuring the same audio content as the three-CD edition with double-gatefold packaging, thirty-two-page vinyl-size booklet, the special twelve-inch turntable mat, along with Syme‘s artwork and Bowman‘s liner notes. Pre-order now at Rush Backstage.